Zakynthos is both lush and tranquil. Sun lovers visit for its incredible coastline and beautiful bays. The island's main town is reminiscent of Venice, with its reconstructed neoclassical buildings. Architectural highlights include the historic St Mark's Square and Solomos Square, as well as a Venetian Fortress and the St Dennis Cathedral. Zakynthos town will definitely delight history buffs, whose first stop should be the Solomos Mausoleum. The museum is dedicated to the island's aristocracy of bygone days. The Byzantine Museum is another gem, given that it sports splendid icons and frescoes salvaged from the island's beautiful medieval churches, which didn't survive the massive earthquake in 1953. Lagana and Geraka may be the island's best-loved beaches. Their white sands are the nesting grounds of Caretta-Caretta sea turtles. Further inland, mountain villages share local hospitality, good food and wine. They're also home to monasteries tucked away within the greenery. 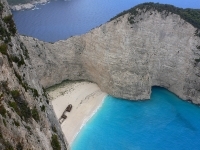 Zakynthos isn't exactly a party island, though its nightlife does offer variety. Visitors can choose from pubs, bars and nightclubs. The trendiest spots are on the south end of the island, mostly in Laganas, Argassi, Kalamaki, Tsilivi and Alykes.